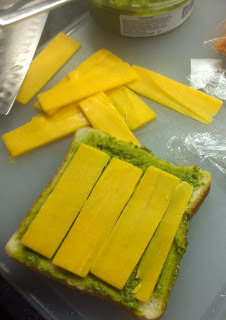 I was perusing the intertubes one day and came upon a cheddar and pesto sandwich, which looked quite tasty. Not sure why I added carrot, except that a bag o'shredded carrot was "aging" in front of the cheddar. But it still needed something added because it was a bit dry. Mayo! Eureka! Now I had an alternative for the veggies attending the shower picnic. You know, the picnic I have only mentioned once ... in every post ... for at least a week. 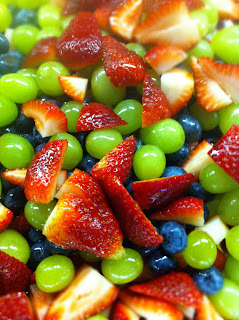 Anyway, one of the picnic invitees needed an egg-free alternative. No biggie -- for her I replaced the mayo with some of the hummus I conveniently had on hand for the crudite dip. This sandwich was a hit, even for the meat-eaters! Only 3 of the massive quantities (12) of petite triangles were left by dessert time. Like several other picnic items, I used a ready-made product to speed up assembly, and this recipe is no exception -- purchased pesto. Whether your pesto is homemade or pre-made, this sandwich is a keeper. A few posts ago, I mentioned attending afternoon tea with theDaughter and her bridesmaids as part of her wedding shower weekend. Among the way-too-many-items for us to devour nibble daintily was a curried chicken salad, served on a microscopic raisin bread round. 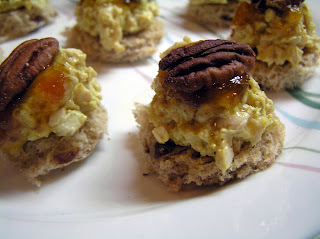 Topped with a few drops of fruit preserves and a nut half, it was as cute as a button ... and almost as miniscule. If you squint, the resemblance is frightening. I finely diced the chicken because it was easier for me ... and because I don't have a working fleishig (meat) food processor. But to really duplicate the original, shred or process the cooked chicken. It'll taste the same, but look and mouth-feel fancier-schmancier.